One approach to reducing friction loss, as well as vibrations, is to focus on an adjustment we normally call “Pinion Angle.” We tend to think of this difference in the angles between the driveshaft centerline (CL) and the pinion gear CL. A more correct term for this angle is to call it the “Working Angle” of the rear U-joint. However, to look at this relationship as being only between the pinion and the driveshaft would be a mistake. We also need to consider the working angle at the opposite end of the driveshaft, where it meets the transmission output shaft. In doing so, we will be considering the entire drivetrain angle. Yet before we leave the topic of what we call this adjustment, let’s understand that to many drag racers, particularly those with leaf spring rear suspensions, the words “pinion angle adjustment” often relates to a tuning aspect of their suspension setup. For these guys, pinion angle is used to adjust how hard they hit the tire on a launch. This is a somewhat controversial topic. For some, the reason for paying attention to pinion angle is so that we will reduce bind in the U-joints in the driveshaft. If we follow this logic to its final conclusion, then the reason racers see a difference in ET, reaction time, or 60-foot time with different pinion angles is that incorrect pinion angle is a form of bind and having this bind is a way to remove violence from the hook. Remove the bind, or in other words have the correct pinion angle, and you’ll hit the tire harder because the suspension will move that much more freely. Such racers often monitor U-joint temperatures with the same heat gun they use to measure track temperatures. The other side of the conversation is based on the notion of harnessing the torque of the pinion gear as it climbs up the ring gear. Drag racers use this rotational force to a better effect than any other type of motorsports. In a leaf spring application, the forward half of the leaf spring is the front/rear locating device for the suspension system. Keeping in mind that this front locator is a spring; it flexes and in doing so, can permit more vertical pinion motion, which lifts the front eyelet of the leaf spring upwards. In doing this, the differential housing is forced downward. Careful racers modulate this downward thrust with some excessive amount of pinion angle that they adjust into the car by adding, or removing, wedged-shaped shims between the leaf spring and the housing tubes of the differential. They are careful because to do this they must tickle the limits of the range of motion of the U-joints. If they exceed these limits too many times, noisy, spinning, middle-of-the-car badness follows. How much torque do we produce at the ring and pinion? We’ll consider a racecar that produces 515 foot-pounds of torque during the usual launch rpm. This is a manual-transmission car with a low gear ratio of 2.95 and a rear-gear ratio of 5.38. Reduce friction and you also reduce bind. We see this attitude in play when we look closely at the engine position in a tubeframe racecar. Normally, to reduce frictional losses, the tubeframe chassis builder, who does not have a stock transmission tunnel to work around, can aim the crankshaft directly at the pinion CL. The crankshaft, input and output-shaft on the transmission and driveshaft are all on the same angle. In this case, the front and rear working angles are the same and we have the least amount of resistance at the U-joints. For this conversation, we’ll take an average of these 10- to 20-percent estimates and say our car loses 15-percent of its torque from friction. That .85 factor at the end of the above formula is one way of reducing the total by 15-percent. Now we know that when the pinion gear tries to rotate upward in this car, it is doing so with a force of nearly 7,000 pounds! (And we wonder why stuff back there flexes.) Scratch one up for the leaf spring guys because they can say this is the DWT force they use to wrap their springs up with and load against the chassis then beat the daylights out of their rear tires. But ladder bar racers and four-link guys can’t forget that they too, use this DWT. Ladder bar racers use it to raise the front rod end against the chassis. In four-link cars, the top bars pull and the lower bars push from this DWT. Pinion Angle? If all we are going to do is think only about pinion angle, many racers measure this angle incorrectly. They think pinion angle is the angle of the pinion in comparison to the level ground. They place an angle finder on the yoke of the pinion and what ever that number is; they call it the pinion angle. For cars with the stock floor still in the car, zero pinion angle is the same as the crankshaft angle. “In a textbook approach, what people call the pinion angle is the working angle of the U-joint at the rear of the driveshaft. There is another working angle at the front of the driveshaft. That’s the one people don’t think about. They don’t realize there is a front working angle and a rear working angle and the relationship is about both working angles. We want them to be the same within a half-degree tolerance. Also, we want no more than three degrees of working angle for the U-joints on either end of the drive shaft. If we are going to consider both front and rear working angles, then we can split the combinations of angles into two types of cars. The first is the tubeframe car, which has the benefit of, the crank aims right at the pinion, working angles are the same, and friction is reduced. So in this case, we compare the angle of the pinion to the angle of the driveshaft, which is concentric with the transmission shafts and crankshaft. The second type of car is one that has the stock floor in The transmission tunnel of the stock floor creates some limitations on the engine placement along with ring-and-pinion location. The crank CL can not be aimed at the pinion CL so the two shafts that will be connected by the driveshaft will be at different heights to each other. That’s when guys get into trouble, The OEM guys have the working angles down pat for the engine/chassis combinations they sell to the general public. When a racer places a different engine in a car, he loses all that engineering that went into driveline placement. 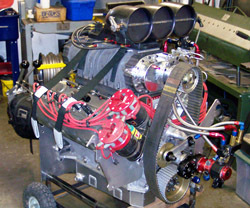 This means that racers, who upgrade to a bigger engine, need to pay close attention to the angle of that bigger motor, which probably does not have the same crank CL height location as the original, meaning the transmission will need to be relocated also; and that changes the front working angle, which no longer matches the rear working angle. Now we’ll return to the issue of using the rear working angle as a means of planting the tires harder. Keep in mind the environment that the driveshaft is in and the job it has to do. It must smoothly transmit massive amounts of torque between two shafts that may, or may not be aligned, remembering also that the angular relationship between the two shafts constantly changes. Launching 3500-pounds of anything is going to resist a lot of force that is trying to move it (the name of the game.) This means that the driveshaft, like most driveline components, is subjected to two loads. These are the huge amount of torque from the engine/transmission and the enormous inertia that is inherent in a 3500-pound car. To be able to transfer lots of torque, move a porky automobile and not bust into a bunch of needle bearings is a very good quality to have in a driveshaft. Everyone who has considered the rear working angle, no matter what they call it, realizes that the angle of the pinion changes as the differential goes through its vertical travel and that it rotates up when torque arrives. The amount of upward rotation is limited by the suspension linkages. These include the leaf spring, which has a lot of pinion rotation, the commercially available ladder bar, which has less pinion rotation than the leaf spring, but more than an equal-length four-link system. When we compare the equal-length four-link system to the triangulated four-link on a Fox-bodied Mustang, where the upper bars are shorter than the lower bars, we see that the equal-length four-link has less pinion rotation. For tubeframe cars, pinion angle is the difference between the angle of the driveshaft versus the angle of the pinion shaft. Knowing how much our suspension linkage changes the angle of the pinion, we can lower the angle of the pinion at the yoke end by the same amount that the suspension permits the pinion to raise under acceleration. * Ladder bar cars normally run three degrees down in relation to the crank. * ( Modern )Equal-length four-link bars run one-to-two degrees down in comparison to the crank angle. To reduce frictional loses and vibration, we need to compare the working angle of the front U-joints versus the working angle for the rear U-joints. We want the two working angles to be within a half-degree of each other and as slight an angle as possible, less than three degrees is normally recommended in drag racing. The exception is in cars with leaf springs where the spring wrap exceeds three degrees and cars with triangulated four-links where the upper bars are shorter than the lower bars. • The driveshaft angle, which is exactly what it sounds like and is the easiest to measure. This is the angle of the driveshaft, which normally spans downward from the tail of the transmission to the pinion in the differential. • The front working angle is a comparison between the angle of the output shaft and the angle of the driveshaft. For this, we’ll need to measure the angle of the yoke at the rear of the transmission, and then compare that to the driveshaft angle. • The rear working angle is a comparison between the angle of the pinion gear and the angle of the driveshaft. For this, we’ll need to measure the angle of the yoke at the front of the pinion, and then compare that to the driveshaft angle. For example, let’s consider a car with the transmission angle at 3.5 degrees, driveshaft angle at 4.5 and actual pinion angle at 3 degrees, as shown below. The front working angle is 1.0 degrees, while the rear working angle is 1.5 degrees. This alignment will probably work, but is at the edge of tolerance, which is a half-degree difference between the two working angles. Both working angles are also less than three degrees, which is considered the limit of the range of motion available from the U-joints.